Arequipa is known as the ‘White City’, because of the city’s numerous magnificent white buildings and architecture. It got its name from ‘la ciudad blanca’, in Spanish, for the buildings are built of sillar which is a white stone. Arequipa is overwhelmingly beautiful, combining the green countryside with the presence of volcanoes and snowfall. This picturesque city is the 2nd most important city after Lima, as well as the 2nd most popular among tourists after Cuzco. 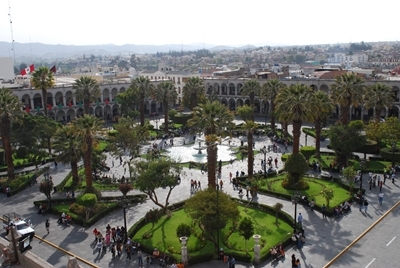 Arequipa is part of the ‘Southern Peru Tourist Corridor’, along with Nazca, Puno and Cuzco. The city is a perfect example of Spanish and mestizo culture in Peru. In fact, there are no Inca artifacts or ruins found in the city. Examples of Spanish colonial architecture are found all over the city. Catholic churches all over the center of the city. There are a number of ancient houses called ‘Tambos’ that serve as living museums. It is declared as a UNESCO Human Heritage Site. The city of Arequipa actually has one of the most excellent climates, receiving 300 days of bright sunshine and blue skies. The temperatures during the winter are even warmer than in the summer. Plaza de Armas – the main square of the city surrounded by white buildings made of sillar (white volcanic stone). Nearby are churches such as San Francisco, La Compania, La Merced and the Cathedral. At least 250 Spanish colonial buildings and churches are declared as Human Heritage Sites by UNESCO so strolling around this area feels like visiting a living museum. Convento de Santa Catalina – this is the most popular place from the Spanish era. The building is a beautiful place filled with colors, flowers and tiny streets, a place where you are transported back in time. San Camilo Market – the oldest market located in the center of the city, three blocks away from Plaza de Armas. Convento de Santa Teresa – you can find some interesting artefacts and stunning paintings here. Museo Santuarios Andinos – the museum that features frozen bodies of sacrificial victims found in volcanoes. Puente Fierro – this iron bridge was designed by the renowned Eiffel. The bridge is still in service up to now. Another beautiful bridge is the Puente Bolognesi, which is also worth visiting. Molino de Sabandia – a 300 year old water mill located in the old Arequipa countryside.